Hezbollah Secretary General His Eminence Sayyed Hassan Nasrallah delivered on Monday a speech in which he tackled various regional and internal topics. Addressing a huge crowd commemorating the 2nd martyrdom anniversary of Resistance Leader Sayyed Mustafa Badreddine, Sayyed Nasrallah stressed that the names of martyred Resistance Leaders must be known and always remembered. “The Leaders who belong to the faithful march are characterized by being harsh in face of the enemy and tyrants as well as being merciful with their beloved, and so was the martyr Leader,” he added. In parallel, His Eminence confirmed that it’s our duty to engrave the names of the brothers who were martyred in the military and security field with gold. “Sayyed Badreddine has emerged victorious in his battles, including confronting the Zionist spy networks and terrorist ones as well as the car bombs in Lebanon,” he added. 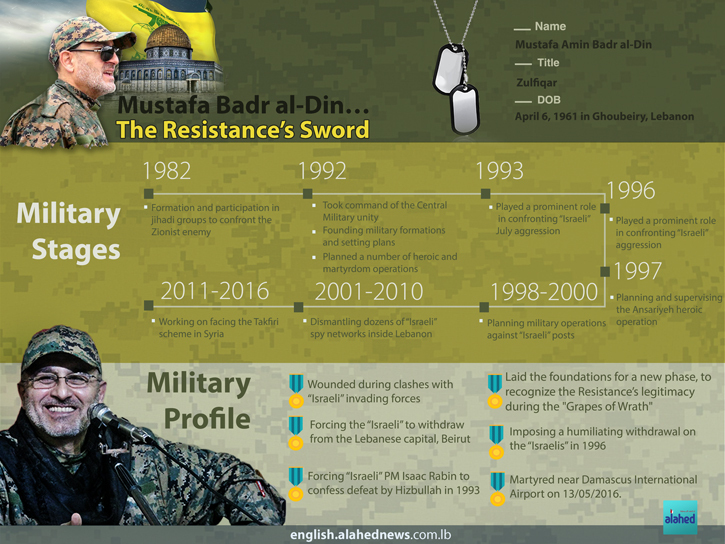 Moreover, the Resistance Leader unveiled that Hezbollah had the honor of launching the nucleus of the resistance in Iraq through martyr leader Badreddine. “He worked hard on dismantling the terrorist networks in Syria and Iraq, and contributed to the Iraqi victory that led to the withdrawal of US forces in 2011,” Sayyed Nasrallah mentioned. “The US experience with nuclear agreement confirms that negotiation is not the way to resolve the conflict with “Israel”,” His Eminence mentioned. He further warned that US President Donald Trump is set to officially announce the so-called “deal of the century” in the coming weeks. 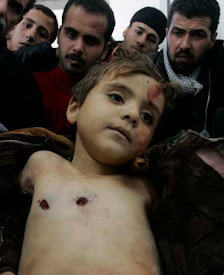 “”Israel” claimed that only 20 missiles were fired some of which were downed, but the truth is that 55 missiles some of which of heavy-caliber were fired at a number of military posts, creating huge explosions, which forced all settlers in Occupied Golan and some in north “Israel” to scramble to shelters in panic,” His Eminence revealed. Meanwhile, he also revealed that the “Israeli” entity was warned via a foreign state that “the next response would be in the heart of occupied Palestine should any red lines be crossed” in “Israel’s” retaliation to the Occupied Golan attack. “With regard to the strike that took place against “Israel” in the Golan, some Arab media tried, by lying, to turn the “Israeli” defeat into a victory,” Sayyed Nasrallah said. 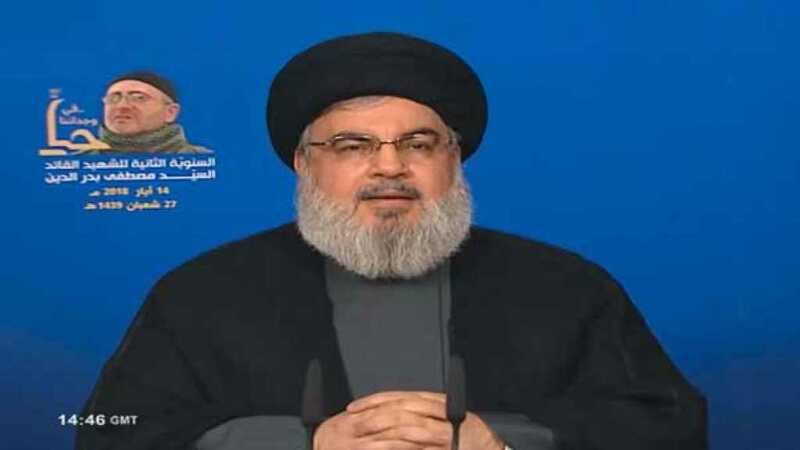 Slamming the Gulf reactions to “Israeli” aggression in Syria as ‘shameful’, Sayyed Nasrallah viewed that There’s nothing uglier than when the “idiot and traitor” Bahrain’s FM says “Israel” has the right to “defend itself”.